When you click on the 'Read' menu in the black navigation bar at the top, you will see a list of stories to read. 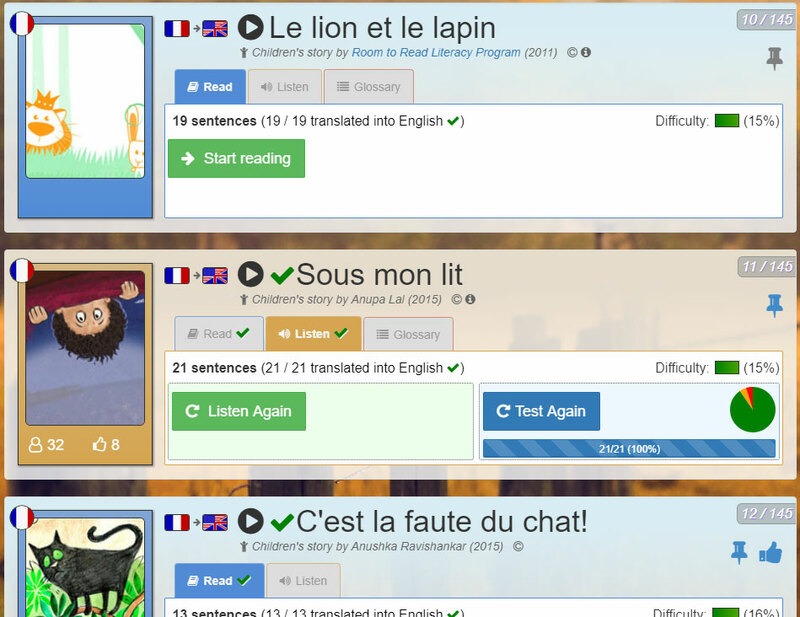 The stories you see here depend on the language you have selected with the language selectors. (figure 1). Next to these selectors is a dropdown (figure 2) where you can opt to show 'All stories' (default) or 'My stories', which will only show the stories you have started or pinned. Below the language selectors you can see a dropdown (figure 3) to sort the list of stories as well as a filter (figure 4) to show only a specific stories. Finally there is the list of stories (figure 5), each with an overview of its content and difficulty as well as your progress. For more info on all the data shown for each story, see the Story card help page. Stories you have finished (and aren't re-reading) will be displayed in a collapsed format (figure 6). Click anywhere on the story to see it displayed in its full format.